When it comes to decorating your yard for Christmas, there’s a fine line between delightful and tacky that all-to-frequently gets crossed in the sheer holiday exuberance. While the exact location of that dividing line is, of course, highly subjective, you don’t really want to be the person on your block whose noisy decorations cause more gagging than coos of wonder. To that end, we’ve come up with a few holiday decorations that are sure to make your Maryland landscape look festive while keeping things classy. Symmetrically placed urns, filled with colorful holiday shrubs, are a great way to border an entryway or path. While you can place any plant you’d like within the urns, it’s best to choose something colorful, like the bright red winterberry, for maximum holiday effect. The festiveness of the red berries clearly signals that this is a holiday decoration, but because it’s provided by nature (as opposed to the garish red of an inflatable Santa) it passes the tasteful test too making it an excellent feature for any holiday landscape. While window boxes are often used to contain brightly colored annuals, those flowers won’t hold up in the wintertime. To decorate them for the holidays, try lining them with a variety of evergreen boughs. The more diversity in your selection, the more interesting the arrangement will be. Adding winterberries and other touches of color certainly won’t go amiss either. Top it all off with a bright red bow and you have yourself Christmas in a window box, a perfect present for your Christmas landscape. 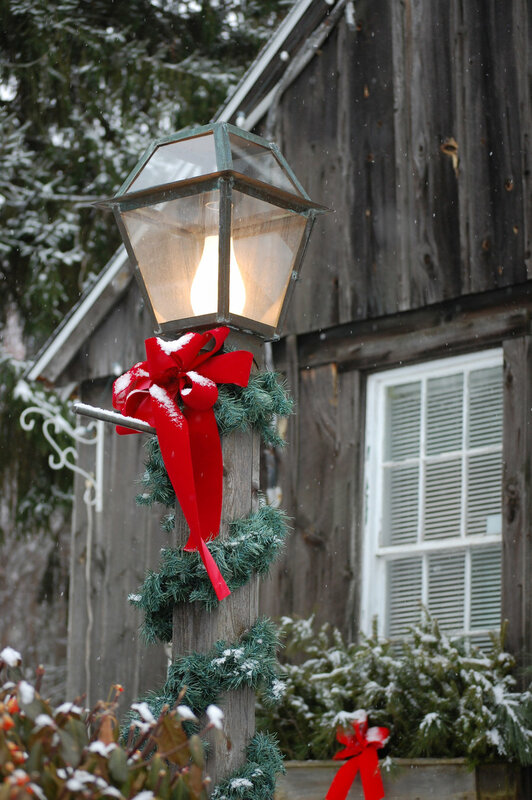 If you have a lamp post near or on your property your Christmas decorating options just got a whole lot more exciting, especially if you’re looking for a more tasteful and subdued decorative style. Lampposts tend to add a pinch of refined style by themselves to any landscape but can also be great places to add easily seen Christmas decorations. Hanging a holly wreath on a lamppost provides an unobstructed burst of holiday color and texture. It’s recommended to stick to natural materials if possible and feel free to garnish the wreath with candy canes or a bow. While you can take care of holiday landscape decorations, the Atlantic Maintenance Group is here to keep your Maryland property looking great all year round. We’re a full service landscaping company, providing maintenance, design and construction, as well as snow removal, asphalt and concrete services. This entry was posted on Friday, January 2nd, 2015	at 5:32 pm	and is filed under Blog	. You can follow any responses to this entry through the RSS 2.0	feed. Both comments and pings are currently closed.